I have olive oil stains on pretty much every single one of my favorite pieces in my closet... I'm testing this stuff out. KAYLA, I WANT THAT SKIRT! 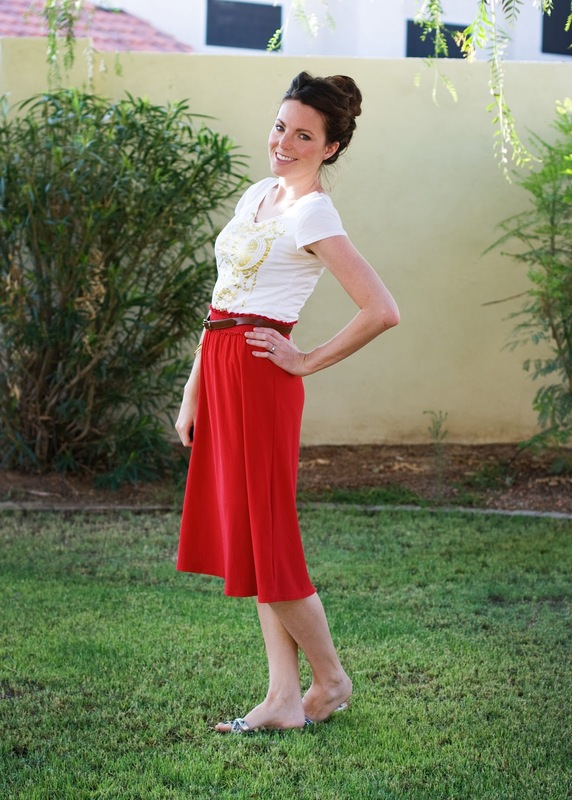 lol Super jealous.I've been looking for a red skirt, but just haven't found one and that one just looks perfect. Good repair! Oh, I need to get me some of that!! I'm about the clumsiest person on the planet. I can't tell you how many things I've ruined with one thing or another spilling all over myself! Oh, my goodness! I am going to try that with crayon stains. Maybe it will work! the chapstick thing is a perpetual problem in the winter! I am like a child and constantly stain my clothes so I will be joining the Shout Advance congregation. i have nothing to be repaired... what to do?! Ummm...yeah, I can't wait to try that stuff. I've got some other clothes that would LOVE to be saved. Sounds like something I need to invest in! Your skirt looks great! Yay for fixing favorite clothes! I've found that plain old dish soap works wonders on cooking oil stains. It was an epiphany I had one day when watching one of those Dawn commercials where they show its amazing grease cutting powers. I don't even use Dawn. I just buy the cheapest generic stuff, and I keep some in my laundry room. I squirt it on any grease spots, make sure they are well saturated, then toss them in the laundry like usual. It even works after they've been through the dryer, which is good since that's when I always notice them. Thankfully I haven't had the opportunity to try it on chapstick or motor grease, yet.